The usual in like a lion and out like a lamb of March has been turned upside down this year. Outside there are crocuses and daffodils shivering in the sudden drop in temperature as March ends. Even with March ending with temperatures reminiscent of Winter or Fall the end of March/beginning of April to me signals Passovers approach. Every year I ignore the containers of macaroons in the "Passover shelves" in the grocery store. 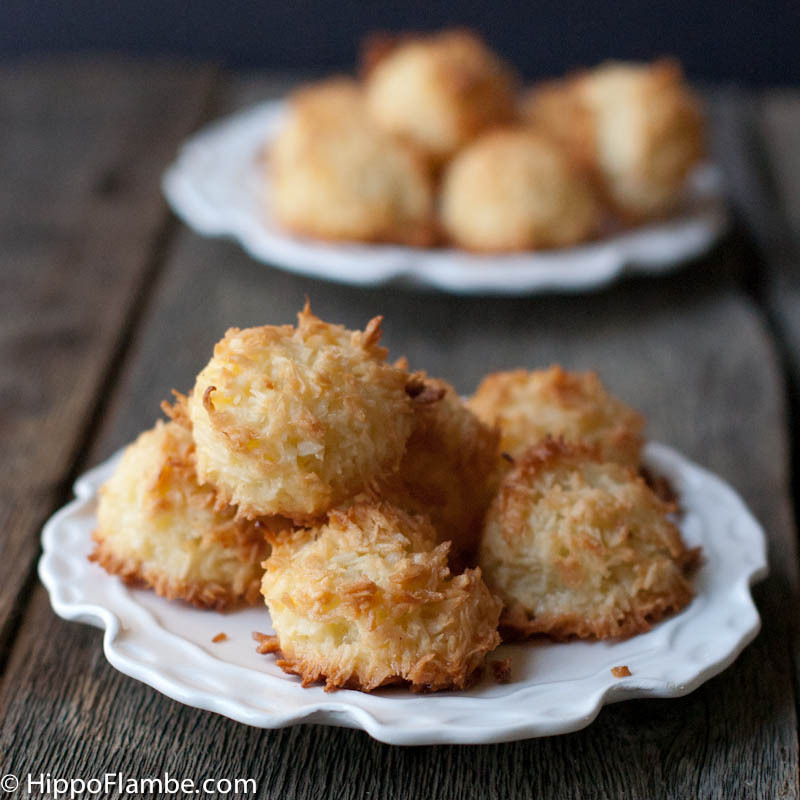 Store bought macaroons are squishy throughout with a flavor that is more sweet then true coconut. A good Macaroon is a personal favorite, at their very best the tender inside contrasts with the crackly outside and their sweetness is subtle against a pronounced coconut sweetness. I have baked up many versions of them, some with beaten egg whites and a long list of ingredients while others required a boxed mix and water. However I was still in search of the perfect recipe. 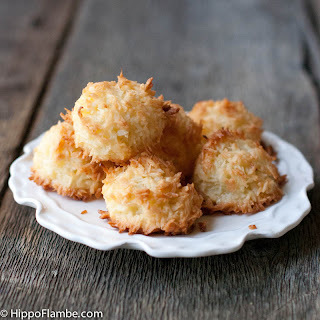 Food52 posted a new macaroon recipe by Alice Medrich's that boasted tiny wings of toasty brown coconut with soft and discrete inside layers, As soon as I read the description I began searching out the large shards of coconut in the recipe. After baking up a batch I found the inside layers to be almost tough, instead of the soft pillowy center I was craving. Lewis loved them, calling them flannel macaroons because they have real texture to them. However the boys both suggested I try again, but this time use the tiny shreds of coconut. I might have switched out the coconut and then just followed the recipe, but then I would have had 8 egg yolks in my fridge. So when the mixture appeared to be dry, I added 2 of the egg yolks back in. I mean who said macaroons have to be made with egg whites only? After all the richness and fat of the egg yolks would add the creamy texture I was after. That is just what they did, there is a still a crackly crisp outer layer where the coconut crisped in the ovens heat, but the inside texture is softer, more giving and tender with a pronounced coconut flavor. I tested the cookies again with all 4 egg yolks and found the extra yolk muted the coconut flavor. So these will not eliminate the yolks in the fridge, but it will reduce it by 2. Mix all of the ingredients well in a large bowl. Set the bowl in a saucepan of simmering water. You are not trying to create a mock double boiler here, the bowl should be in the water. Mix the batter well using a silicone or other heat proof spatula for about 2 to 5 minutes, just enough to dissolve the sugar and warm all the ingredients. Set the bowl of cookie batter aside for 30 minutes so the coconut can absorb some of the liquid. While the batter is resting place the oven racks in the upper and lower third of the oven and preheat to 350°. Line 2 cookie sheets with parchment paper and scoop out tablespoon sized balls of dough spaced 1 inch or so apart on the sheets. I used a 1 Tablespoon cookie scoop to portion the dough out. Bake for 20 to 25 minutes, rotating the tray positions after 10 minutes, until the cookies are golden brown. To cool either places the pans directly on cooling racks or slide the parchment paper on to the racks. Happy Birthday! The cookies look delicious, and a very blessed Passover holiday to you and your family. Mhmm these macarons are gorgeous! Funny my husband just said to me, you know what gets me through Passover? I said what and he said Macrarons. So its off to the store I go!